Recently updated by the authors, this lively A-to-Z reference guide shows readers how to prepare essential oils and use them for healing physically and emotionally. This handy book includes individual oil profiles, applications, and the physical and emotional conditions that warrant their use. It organizes fifty-eight oils into accessible, alphabetical listings, from basil to yuzu. Special formulas for blending essential oils for a myriad of home and health applications are provided. Detailed treatment suggestions for such special circumstances as pregnancy, children and babies, chronic pain, terminal illness, and pre- and post-operative conditions are included. 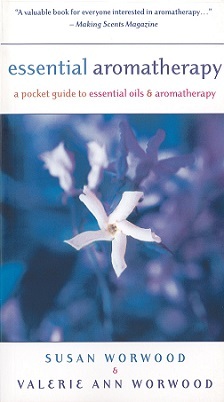 This is a comprehensive, easy-to-use guide for all readers, from beginners to professional users of essential oils and aromatherapy. Susan Worwood is a professional clinical aromatherapist specializing in sports injuries and chronic pain conditions. Valerie Ann Worwood is aromatherapist to celebrities and royalty. Internationally acknowledged as one of the world's leading aromatherapists, she is the author of five books on the subject, including The Complete Book of Essential Oils & Aromatherapy. She lectures and conducts workshops around the world and has initiated research projects into the use of essential oils.